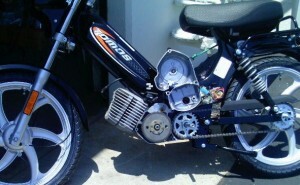 2011 Tomos ST with left cover removed. 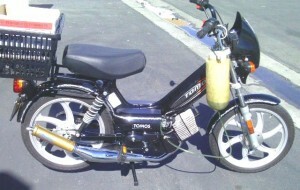 Tomos has made oil injected mopeds, US models, for over 33 years, since the 1979 Silver Bullet. Ever since, every deluxe Tomos with oil injection has a small oil pump mounted onto the left engine cover, over the magneto. They have an excellent reputation. The highest mileage mopeds, in general, are the oil injected ones. When the engine is not too modified, the oil injection gives it the right amount of oil, automatically, all the time. You don’t have to mix the two cycle oil with your gasoline if you have oil injection. Serious commuters and most people in general prefer the convenience of oil injection and are willing to pay a little extra for it. Above, close up of 2011 ST flywheel. At center, the special nut with a groove in it for the oil injection pump. Until about the mid 2000’s, the magneto nut had two outer prongs that held an free floating aluminum disk with a groove in it. This upgraded nut has a steel disk rubber mounted and bonded to the nut. Click to enlarge any of these pictures. 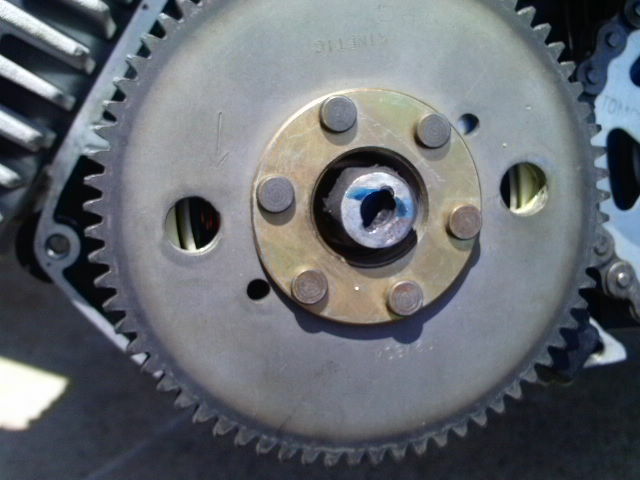 Inside view of left engine cover showing oil pump tongue. The left cover is easy to remove, but hard to put back. 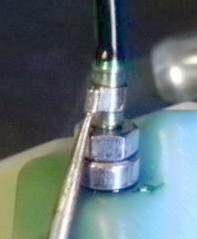 The tongue on the oil pump must be pointed in the same direction as the groove in the flywheel nut. Besides that, two precision 9.8mm sleeves, one at the upper cover bolt, and one at the lower cover bolt, must line up with their holes in the aluminum engine case. What is difficult is you can’t see it. It’s a “blind operation”, which is something that is done with your eyes closed, mostly by feel. When you think the tongue and groove are at the same clock position, say 12 o’clock, then you must turn the cover around and place it exactly on the two alignment sleeves. It usually never goes all the way on until you hit it lightly with the soft side of your fist. When it’s not lined up, it makes a thud or thump, and there is still a small, like 1/16 inch gap between the cover and the case. When it is lined up, hitting it lightly makes a loud clap, as the aluminum cover slaps or snaps together with the aluminum engine case. 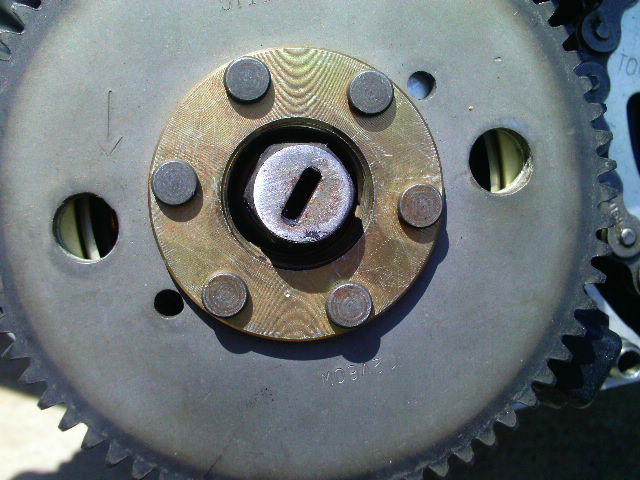 On this flywheel nut, the oil pump groove is completely rounded. It no longer drives the pump. As long as the person doing the service does the procedure properly (lining up the tongue and groove) and does not leave out the alignment sleeves, the oil injection performs reliably for many tens of thousands of miles. The most common source of trouble is improper servicing. 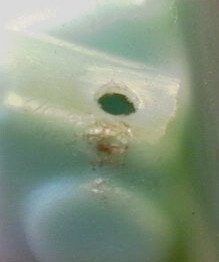 When the tongue and groove are not engaged, there is a small 1/6″ gap between the cover and the case. 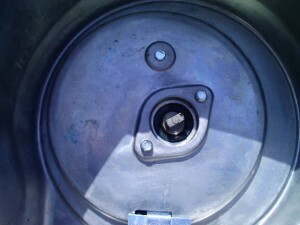 If the three cover bolts are then installed and tightened down, the cover will be forced to go all the way on. 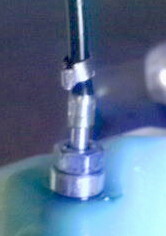 Eventually the oil injection will fail when the groove hole becomes completely rounded out, and no longer engages the tongue. When that happens, the oil pump stops pumping, and soon after that the engine seizes up. Tomos oil line clamps work good when they are put on right. Here’s all about it. Left, factory installed clamp. 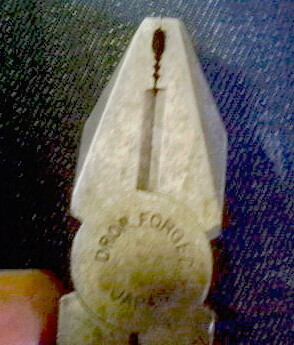 Middle, spreading with a dental tool. Right, lifted over the lip of the spigot. You can see a green “tail” on the right of the cup. What’s funny is that is not the crack, but it looks like one. Slightly pressurizing the tank with air revealed that there was a crack, as oil was seen leaking out. The real crack is where the punch is in the middle picture. 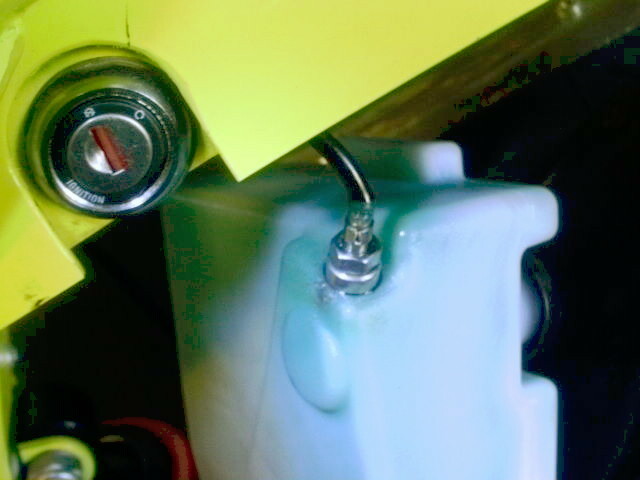 Nothing sticks to this kind of plastic, so plastic welding or tank replacement were the two options. Left to right: 1) Spreading open the crack with a tapered punch. Then cleaning off the oil with spray solvent and compressed air. Then warming the plastic with a soldering iron, pushing softened plastic from either side towards the crack, filling the center. Then pulling the punch out to allow the tension to close the crack. 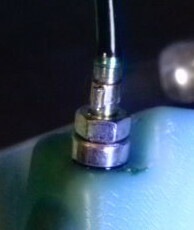 After cooling the sealing surface around the hole is made flat with a disc grinder. 2) The plastic welded oil tank, ready to put back on. 3) An old pliers is ground away about 1/16″ from the end, to make an empty pocket for the loop part of the Tomos oil line clamp. 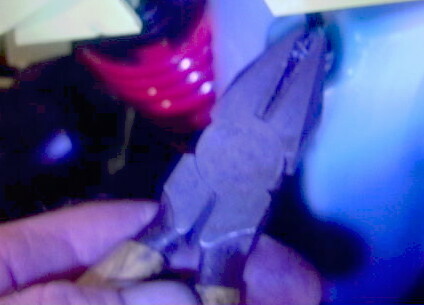 4) Squeezing the clamp tight with the special pliers. 5) The oil line is re-clamped properly. You cannot rotate the oil line or clamp, because it is tight. The loop of the clamp is not smashed, thanks to the cut away in the pliers.Click on the far right picture and you’ll see the rounded loop. When the loop is smashed, it can eventually break and come off. That can be a mess, or it can be a disaster. 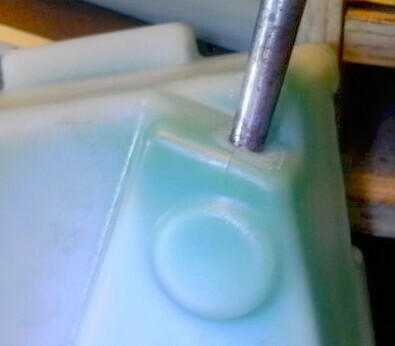 After the oil is put back in, the long oil line, which supplies the oil pump is bled by removing the bleed screw. Once that is done, only the short line from the pump to the engine is still full of air. The only way to “bleed” that is to run the engine on temporary gas with oil mixed in. It takes 5 or 10 minutes to go about 10 inches. The oil flows very slowly, about 3-4 drops per minute, at 7000 rpm. You are currently browsing the archives for the Tomos Oil Injection category.